On a Thursday afternoon, Da’Shawn, Ali, and Kendrick sit in the Baltimore Youth Arts gallery space on Mulberry Street with staff members Marketa Wilson, Leisha Winley, Bomin Jeon, and Joey, a volunteer through MICA’s Community Art and Service program, and plan what to sell at their table at their upcoming holiday sale. Da’Shawn wants to paint on pants and sell them, but pants are hard to sell, Ali points out. They fit everyone differently and people gotta try them on before they buy them. Plus, Ali just doesn’t think painted pants are cool. “You can walk around with paint on your pants,” Ali says, cracking everybody up. Young people come to the community studio downtown pretty much every day. The size of the group varies naturally—people come by less often when they get jobs, or if they have to take care of their families, or because of school. But this fall there’s been a steady group of about five to 10 regular attendees. 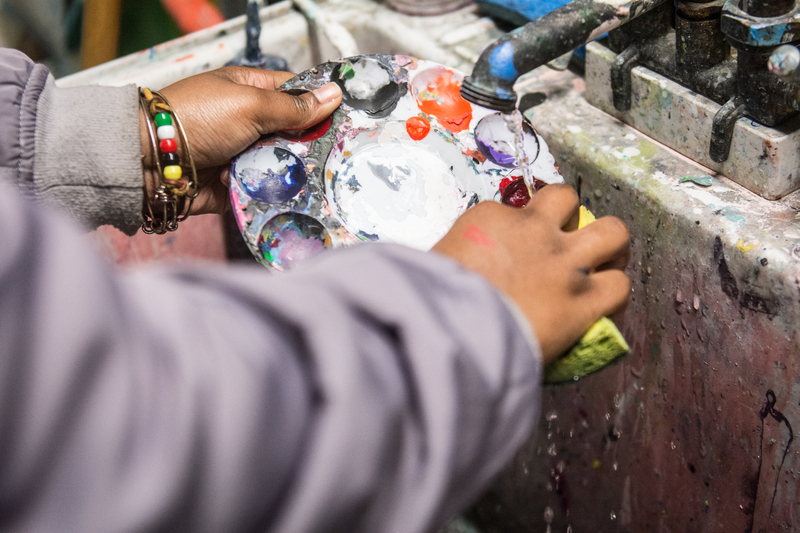 Founded in 2015, BYA provides an afterschool program and a platform for young people, many of whom are involved in the juvenile justice system (or are transitioning out of it), to create and sell art and to be in community with other young artists. It is a shining example of the kind of community-based program that can be a balm for youth in Baltimore who face enormous, systemic issues of poverty, trauma, and inadequate education and housing. The type of program that the police commissioner admitted the city needs more of, in a recent press conference where he also said that the city needs to be tougher on youth who cause violence. BYA’s approach is holistic and interdisciplinary; the days in BYA’s community studio vary in structure and activity. Mondays are for job readiness training with Wilson, the studio apprentice program coordinator, who finds ways to get the participants excited about the hunt, looking for opportunities for youth based on their individual interests, going over resumes and applications with them too. On Tuesdays the youth work on design, zines, and blogging with Jeon, exhibition and outreach coordinator, and volunteer Gabriella Souza, former arts editor of Baltimore Magazine, who helps them with writing and interviewing techniques for the BYA blog and their publication The Gathering. Wednesdays are open studio; Thursdays are for screenprinting and meetings to figure out what’ll happen in the gallery space. On Fridays, it’s just the staff there to catch up on other work and planning, but sometimes students pop in just to say hey. He also claims he’s not really an artist: “I can’t even write straight, when I write on a blank piece of paper my words be slanted,” he tells me. “So then when I draw, everything ain’t gonna be even.” But he walks me over to the fireplace in the gallery where his drawing sits, leftover there from the Halloween party fundraiser BYA hosted. A disembodied, blood-dripping hand holds a branch blooming with skulls, surrounded by blocky, bare trees and dark clouds. “Came out alright . . . for me,” he razzes. Ali says he appreciates “the vibe” of BYA, and he’s motivated to learn from everyone he meets—the instructors and volunteers at BYA, the visiting artists, and field trips to galleries and museums. India washes a palette. Photo by Reginald Thomas II. A couple of weeks earlier, I’m sitting in the basement studio, the walls of which are accented with shades of teal, green, and aquamarine, and built out with cubbies stuffed with student artwork and shelves for art supplies, art books, and magazines. “All three of them went to the job fair this morning, Kendrick, Da’Shawn, and Ali,” Wilson, the studio apprentice program coordinator, tells Gianna Rodriguez, BYA’s director and founder, when she comes into the studio. Rodriguez says she wants to paint that quote really big somewhere in their studio, maybe on the ceiling, or in the bathroom upstairs. BYA acts as a conduit for youth to other services that it can’t directly provide. Citing the mural projects BYA members have worked on for the past two summers, through the city’s YouthWorks program, Wilson emphasizes that connecting young people to communities is vital: “That’s how we all get our jobs,” she says. 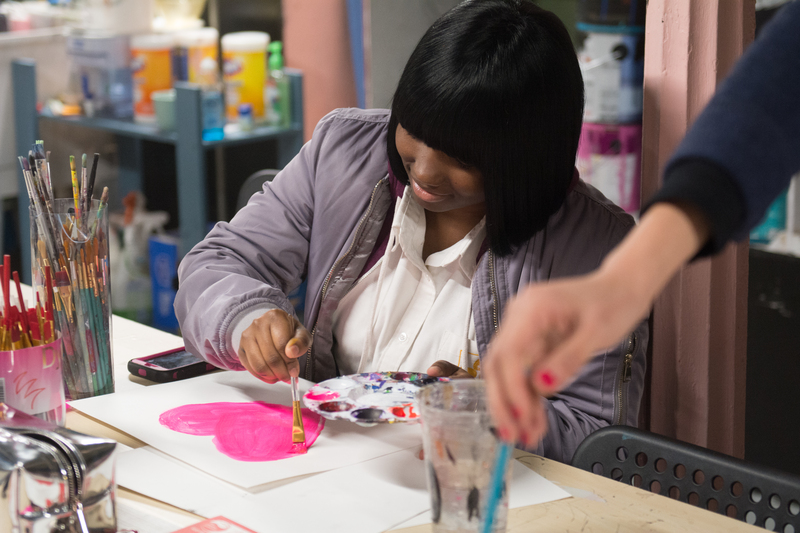 Baltimore Youth Arts has provided art classes, job readiness, dialogue circles, and more at various sites, including the Baltimore City Juvenile Justice Center (BCJJC); Thomas J.S. Waxter Children’s Center; Lillian S. Jones Recreation Center, which started as a partnership with Friend of a Friend, the organization co-founded by Dominique Stevenson and former Black Panther Eddie Conway. Its YouthWorks partnership paid young people to paint murals at the Waverly Ace Hardware’s garden section and Playworkz Learning Center. A small and motivated staff—which includes Rodriguez, Wilson, Jeon, special projects and development associate Leisha Winley, and youth opportunities coordinator Jonathan Jacobs, and three volunteers—works with youth in the community studio, located in the basement of Platform Arts Center, every day. Visiting artists like photographer Shannon Wallace, painter Jerrell Gibbs, graphic designer Jermaine Bell, and many others have come through to work and share with youth. And you’ve probably already encountered these young people and their work at all kinds of art shows and art markets around town too: at Gallery CA, Platform Gallery, the 2640 Space, Open Space’s Publications and Multiples Fair, and elsewhere. Not all of the youth who participate in BYA are involved in the juvenile justice system—some are just there for after school, because a friend told them about it. “Having a mixture of youth who are and aren’t in the prison allows for anonymity, and also peer mentorship,” says Rodriguez. Amani, a kind, sharp, and talkative sophomore at the Baltimore Leadership School for Young Women, has been coming to the BYA studio around the corner from her school since May. She says it feels comfortable, open, and friendly. The first official event BYA hosted in the space was its recent Halloween party/fundraiser/art auction: Local artists donated work for the auction; there was a photobooth with terrifying cardboard masks that youth made and tarot readings from a deck the youth designed. Daydrin, 17, interpreted the cards I drew (Mr. Clean, an antique map, and stacks of cash) to mean that unfortunately, I was going to go bald, but I was going to get to travel to China, and also I’d be receiving a million dollars sometime soon. (I’m totally cool with all of that happening, for the record.) The opening of the combination shop/gallery will coincide with BYA’s holiday sale on Dec. 16. The number of young people who comprise Baltimore Youth Arts and who come through its community studio every day fluctuates throughout the year—that’s partly because of funding, Rodriguez says. A few young people have been with the program pretty much since it started. Since the spring of 2016 until this past August, BYA had been able to pay youth to be studio apprentices, thanks to a grant. They didn’t receive that grant this year, which Rodriguez says was kind of a blow to the program: Some young people who’ve been paid through the studio apprentice program for a long time had to step aside to find work elsewhere. In the few weeks this fall that I spent hanging out in BYA’s community studio, there was a pretty steady group of five to 10 people, a lower attendance than they’ve had in the past. Winley and Rodriguez are working on ways to expand their capacity, and mostly that means applying for a ton of grants. But these challenges, Rodriguez says, are leading the team to think about how BYA can retool its approach, and shift more toward advocacy for youth. 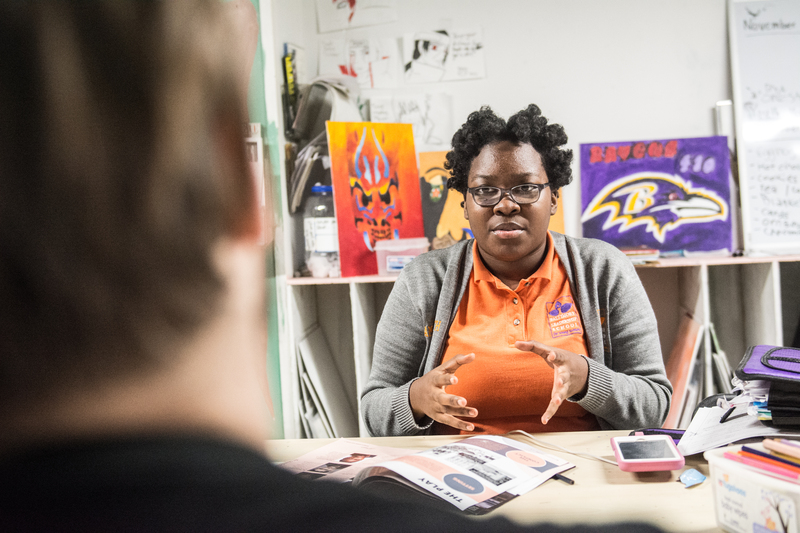 She has been doing work like this for years—not just in Baltimore—and she would like Baltimore Youth Arts as an organization to be able to be more public about the impact of the arts on youth inside and outside of the justice system, as well as the impact of the justice system on youth. “It’s not just an art education program,” she says, pointing to the myriad other important but less publicized ways she and her staff help young people with job and college and FAFSA applications, driving them to the DMV to get an ID so they can get a job, supporting them at court hearings. Rodriguez, an artist and teacher, founded Baltimore Youth Arts in Jan. 2015, shortly after she moved here from Providence, Rhode Island. She knew she wanted to teach art and work with incarcerated people—she modeled BYA in part after a similar program in Providence, AS220 Youth, where she worked for six and a half years. She notes that though she’s been affected by the criminal justice system—witnessing its injustices, seeing family members and friends get locked up—she knows it’s not her own experience, which is why feedback from the communities and facilities she’s worked with so far have been invaluable. And although creative outlets are vital, BYA isn’t solely an outlet. When BYA is present at art shows and markets to display and sell their work, young people have the chance to talk to people about their art, sell it, and then keep most of the money (BYA takes a small cut, usually about 10 to 15 percent, to recoup the materials cost). Baltimore Youth Arts director Gianna Rodriquez talks to Kendrick. Photo by Reginald Thomas II. Outside of its community studio, BYA’s other consistent site presence this fall has been at BCJJC. BYA is the only arts and job readiness program offered in BCJJC, and until they run into some more money to pay more instructors (and to go back into other facilities) Rodriguez is the only instructor. Over the course of three days a week, she teaches 18-22 young people the basics, like painting and drawing. BYA staff conduct dialogue circles and help with resume writing and other job readiness activities sometimes too. The size of each class at BCJJC varies because most youth are only there for a week or so, awaiting their court dates. And because of the high turnover she says the structure winds up feeling open and collaborative, with young people who have been in there longer helping out those who are newer to it. Rodriguez understands she’s not necessarily training up a swarm of young people who will all pursue a career in the arts, but sees how the arts can provide youth with skills they can use. When Rodriguez and other staff try to recruit young people at BCJJC to join BYA when they get out, they meet youth who are interested but have been charged as adults and might have longer sentences. Dante Scancella, a social worker with the Maryland Office of the Public Defender’s juvenile division, has so far worked with two youth connected to Baltimore Youth Arts. He sees the impact that BYA and community programs like it can have on youth—not only while they’re involved in the juvenile justice system but also as a way to ideally prevent them from having to enter the system at all. “I think we see the end result—the youth being charged with a delinquent act—but we do have to look more holistically,” Scancella says. Scancella works with young people at various points in the justice process and he says that a huge part of someone going back into their community is “after-care planning,” which BYA and programs like it can help with. “From a social work perspective I see a relationship as the vehicle for change,” he says. Just a couple of weeks ago at a press conference, Police Commissioner Kevin Davis called for a crackdown on “violent juvenile repeat offenders” whose adult charges, he said, keep getting waived down back to juvenile court. Davis acknowledged systemic issues—poverty, family instability, addictions—that are linked to crime, but maintained that locking up more youth for violent crimes is the best way to hold them accountable. This reeks of the paranoid rhetoric on youth in the ‘90s—the mythic “superpredator” generation of violent youth—which led to legislation that caused more youth (predominantly African-American youth) to be sentenced far more harshly, instead of being funnelled through the juvenile justice system, which, in many jurisdictions, including in Maryland, purports to rehabilitate youth or divert them from the system. Pushing to charge and sentence young people as adults also ignores the fact, as numerous studies and reports have shown, that locking up young people ultimately causes far more harm than public good. The statistics also indicate that youth of color are disproportionately locked up more than white youth are. The Annie E. Casey Foundation has looked into this extensively; in its 2011 report on juvenile incarceration “No Place for Kids,” the foundation wrote that incarcerating young people is ineffective in terms of rehabilitating them—nor is it proven to reduce juvenile crime—and it’s a waste of public resources and money. “[T]he states that decreased juvenile confinement rates most sharply (40 percent or more) saw a slightly greater decline in juvenile violent crime arrest rates than states that increased their youth confinement rates,” the report reads. The report also notes that young people who get detained are more likely to recidivate, and that likelihood increases the deeper one goes into the system. Without proper resources and community support and intervention, it can be hard to break that cycle. “If we want to decrease violence, we have to decrease the motive. We have to make sure that kids have adequate housing, that they have adequate access to job training, to those that have been pushed out of school, have a real, concerted, trauma-specific mentor who can bring them back in,” Jenny Egan, a public defender who works with youth, said in a recent Real News segment with Baynard Woods. Juvenile crime has been steadily decreasing, she said, and sending the youth deeper into the system will likely do little to curb violence that’s happening now, and only increase long-term violence. It is also a waste of money to detain youth, when detention is not proven to help them. Baltimore City funds the Baltimore Police Department’s almost-half-a-billion-dollar budget; meanwhile, so many of the community-based, citizen-run, and citizen-led initiatives and programs (like BYA) depend on grant funding—which can be sparse and competitive—donations, and an occasional city sponsorship or partnership (i.e. Youth Works). These programs, which provide the type of community supports that a city needs, are essentially DIY. 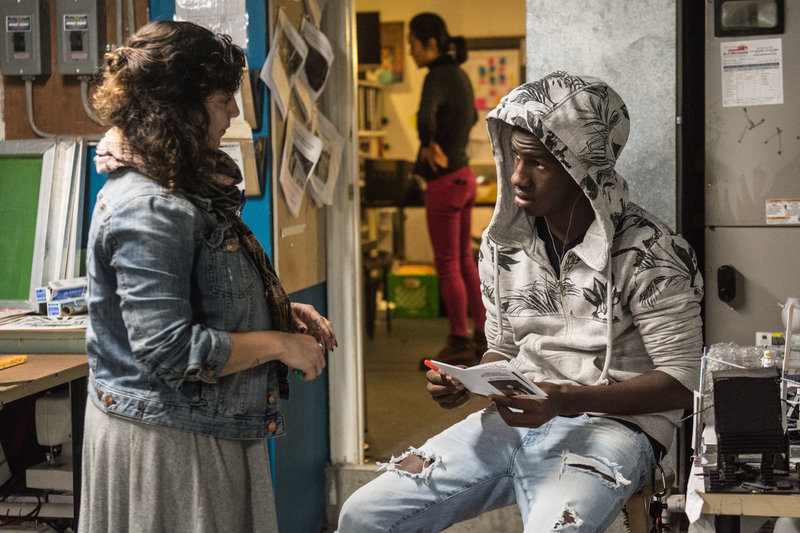 When young people work with BYA, it is all documented: They sign in when they come into the community studio; at detention facilities the staff records young people’s attendance; there are photos of young people working together in the studio or out on field trips to galleries and museums. And their work—their art—becomes proof of their participation too. Recently, BYA staff went to court to support a young person (who will remain anonymous since he was a minor at the time) who had been charged as an adult, hoping that the judge would knock down the boy’s charges. Rodriguez shared with the boy’s social worker and lawyer images of him working with BYA and wrote letters of support for him, providing proof that he was working in his community and trying to get right. The boy had been a member of BYA since early 2016, before this recent incident. BYA’s presence at the hearing, along with his family and a youth coordinator from the boy’s church, helped get his charges waived down to juvenile court. He is currently detained at BCJJC. In gathering information for his case, his social worker, Scancella, said that this youth told him about the relationships he had with staff and his peers at BYA, how they had benefited him. “He was getting things there that his own family couldn’t provide him,” he said. The youth’s mother (who wanted to remain anonymous) said that the workforce guidance from BYA helped him, and that BYA kept him busy and out of trouble. The past year has been particularly hard for BYA. A girl that Rodriguez had worked with at the Lillian Jones Recreation Center was killed in a drunk driving accident. A young man who had been in a class at BCJJC was shot. Two young men who were close to BYA were killed within a few months of each other: Amoni Grossman, 19, was shot in September 2016 in the Greenmount West neighborhood. And this past January, BYA staff and members woke up to the news that Dasean Mcelveen, aka Smoke, a 17-year-old who had joined the group’s studio apprentice program last fall, had been killed. According to police, Mcelveen had been walking around the Coldstream-Homestead-Montebello neighborhood with a 20-year-old man when a black van pulled up alongside them, and a passenger shot at them. Rodriguez described Mcelveen as a very driven painter and graphic designer. “The last time we spoke he said that BYA was the only thing he had going for him,” she told me in January. In this line of work, Rodriguez says, you understand very clearly the complexity of people. On a Tuesday evening class at BCJJC, Rodriguez counts out the paintbrushes, pencils, and paint tubes before the seven young men come into the classroom. She has to keep inventory before and after class because if something goes missing, the boys’ spaces get searched. She counts everything out twice. This particular group has been working with her for a while—many of them have been charged as adults. Throughout the hour-long class, the boys mostly stay seated at their benches and work on paintings that they’d started in a previous class. There are a lot of hearts on their canvas boards tonight: a broken purple heart; an ultramarine blue heart, in memoriam to someone who has died; a cherry red, perfectly symmetrical heart; a slightly less symmetrical one with a pink crown painted on. One young man focuses on smoothing out the blue, white, and yellow gradient background in his painting. In the middle, a red heart with a black Charlie Brown-like zigzag in the middle of it bleeds red and black drips down to the bottom edge of the canvas. He’s concerned that his super neat hand lettering, “NO LOVE,” is uneven, but it seems pretty precise to me. Rodriguez floats from station to station to help the students draw out a hand here, or a banner there, advising them on color palettes or resolving backgrounds or how to cover up an errant brush stroke and make it look intentional. “You can never make a mistake with paint,” one student says to himself, squeezing a tube of white into a well in his plastic palette. She points out that his neighbor sitting next to him, the one working on the dripping heart, has already made $35 or so on prints that BYA made of one of his paintings. He’ll get that money when he gets out. Amani talks to Jonathan Jacobs. Photo by Reginald Thomas II. Outside on the noisy stoop at Platform, Kendrick tells me he started with BYA through YouthWorks in 2016. He says he’s usually more of an abstract artist because he doesn’t really like to draw people—he prefers to “throw things on the canvas and just work with that,” he says. He masks off parts of his surfaces with tape and paints over it, an analogue version of a technique that he uses in his graphic designs too. Kendrick says he learned a lot about Illustrator and Photoshop at BYA, and he shows me a few of his designs on the computer, including a T-shirt design collab with a friend, an illustration of Goofy with gold fronts and a chain. At BYA Kendrick has designed shirts and buttons, and he made the cover art for the second edition of their publication The Gathering. He shows me the original painting, two light brown hands with thick black outlines against a stark white background. He says it’s a reference to the “hands up, don’t shoot” chant; he painted this the summer after Freddie Gray was killed. Kendrick says he’s not exactly sure how his attitude about art changed, but he notices that making art can be restorative. Daydrin, a 17-year-old junior at BLS, got placed with Baltimore Youth Arts two summers in a row through YouthWorks. Now she comes to BYA after school, and she wants to become a fashion designer. She’s looking into a school on the eastern shore where she can major in fashion. “I’m here just to work on things that I feel passionate about,” she says. For the spring, Jeon is trying to help plan a fashion show, which Daydrin is excited about. She’s working on some designs for a class presentation (“mine will be short and sweet,” she swears), experimenting with watercolor pencils. The figure she’s drawn has an olive green mini skirt and a beige top with puffy, sheer sleeves. She has been into fashion since she was 14, but felt like she needed a push. Tenasia and India, both seniors at BLS, heard about BYA from Daydrin, who told them how much she liked it. They’ve been coming through for a couple months. Both Tenasia and India, who have been friends since they started attending BLS in sixth grade, have been accepted to several colleges, and they’re trying to decide where to go. Tenasia wants to study mortuary science, she says, because she felt strange after her grandmother’s death. India paints. Photo by Reginald Thomas II.